In July last year I was contacted by Chris Hirst, a teacher at Stretford High School. 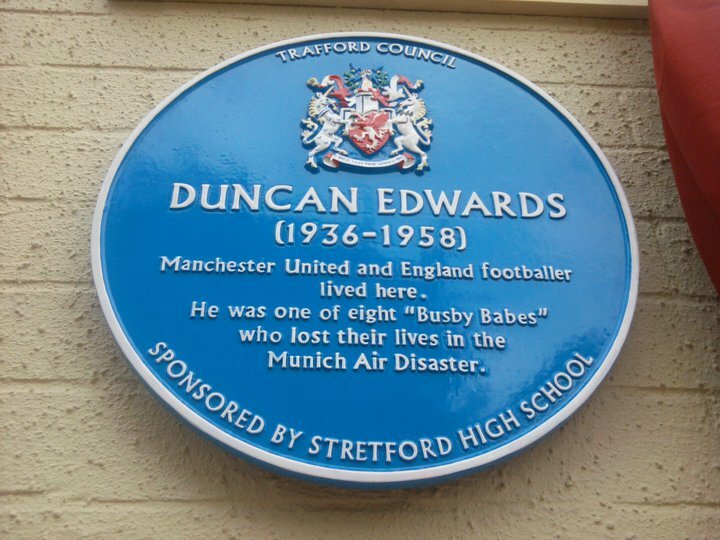 His students were undertaking a project (which he was leading) and he wanted to know where some of the Busby Babes lived. 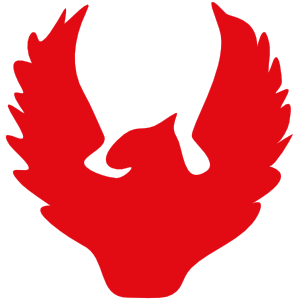 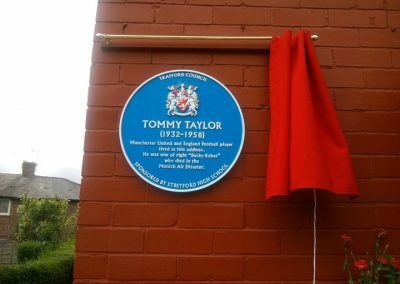 I put him in touch with my friend Tom Clare who, from all accounts, has been a great source of help and provided a great deal of information for this project. 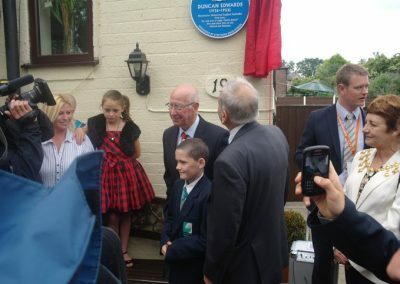 The following is taken from this week’s Stretford and Altrincham Messenger website. 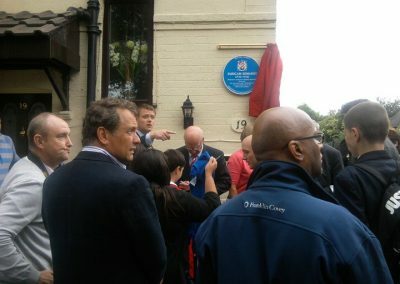 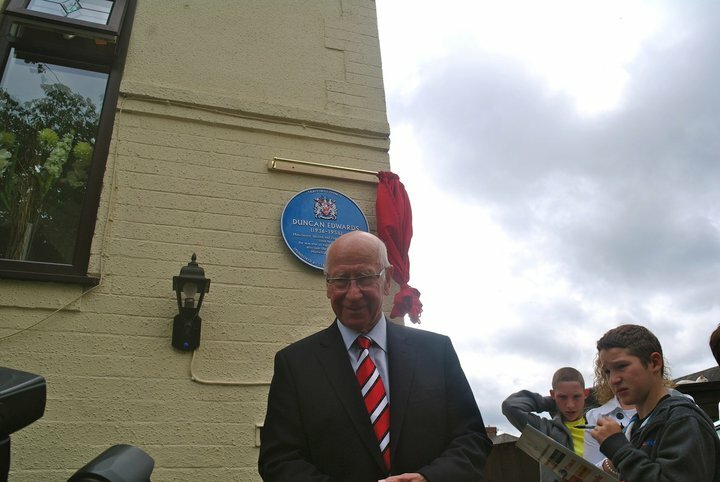 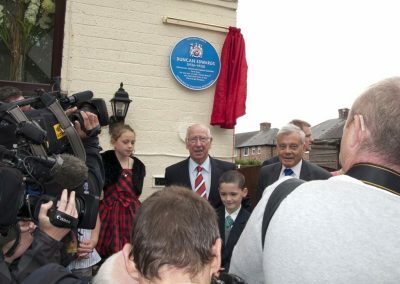 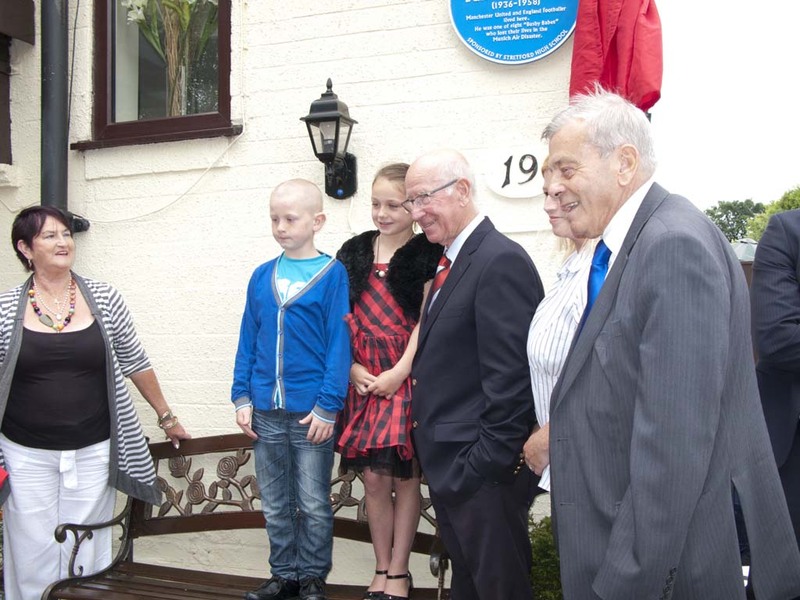 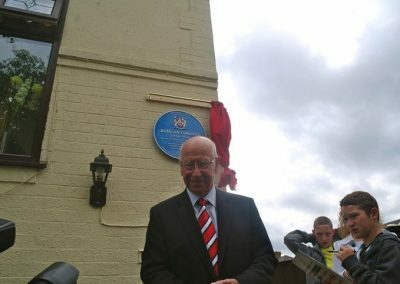 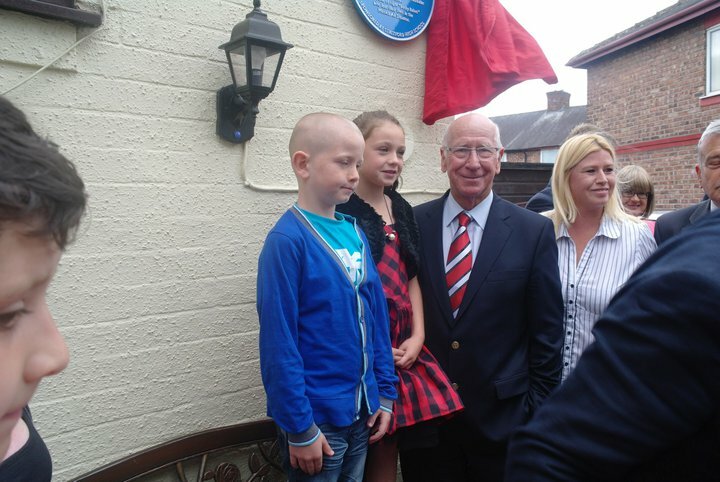 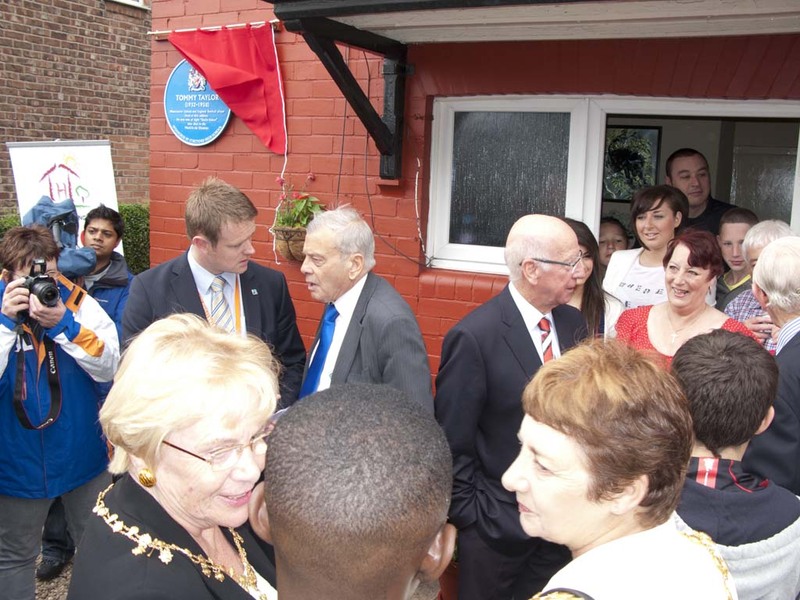 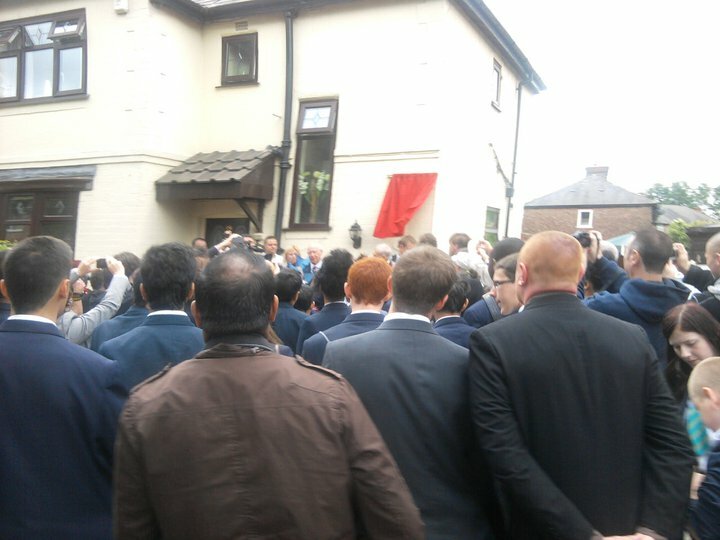 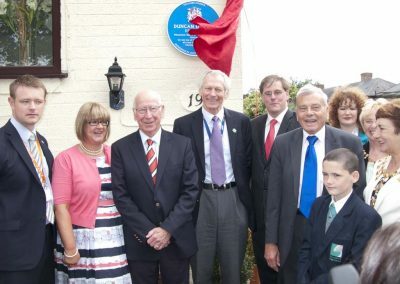 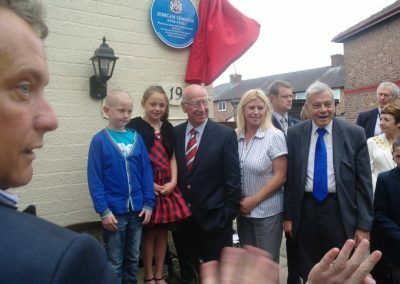 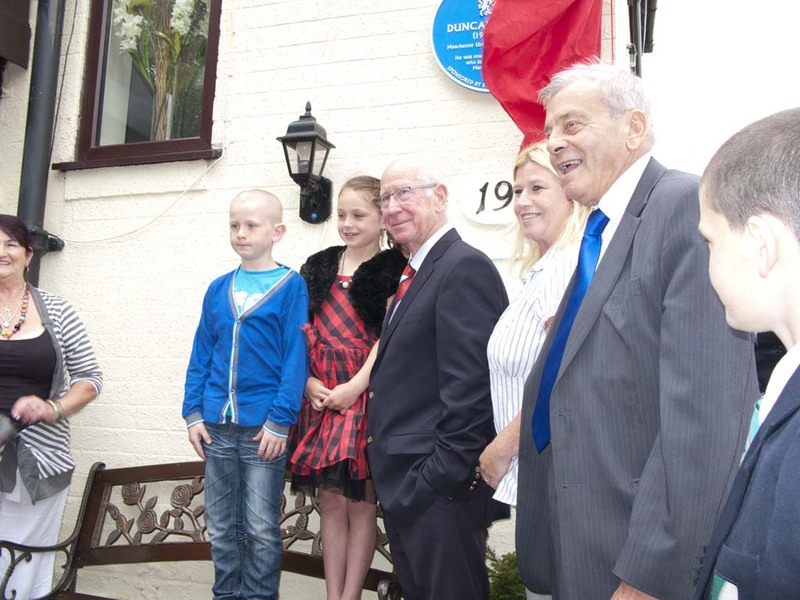 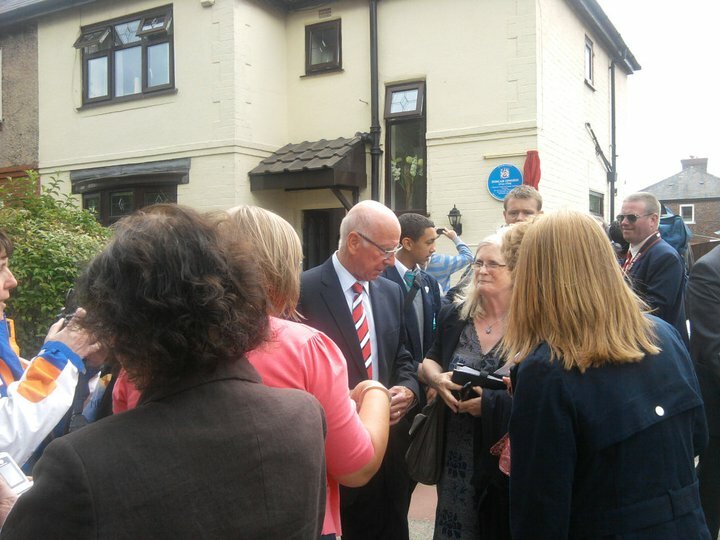 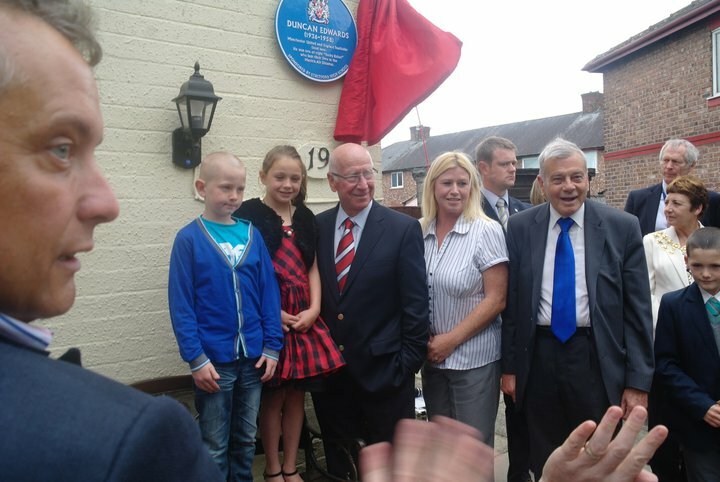 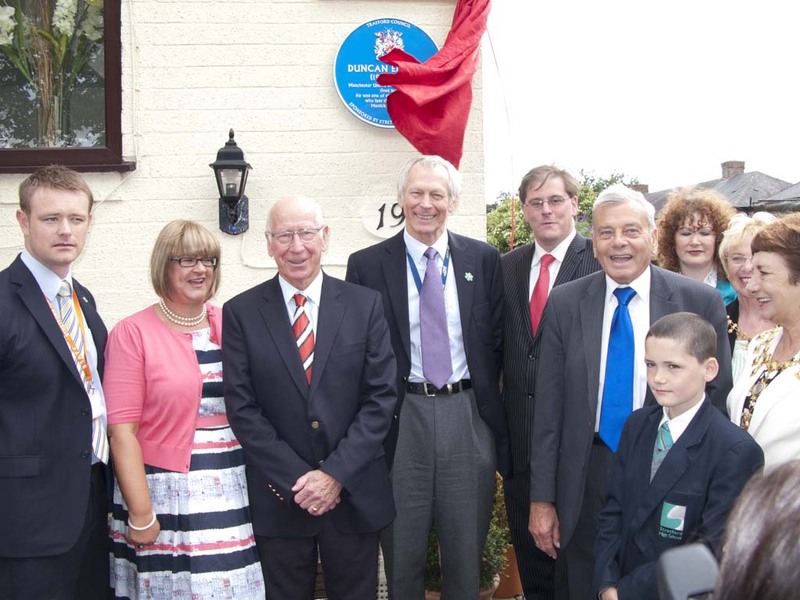 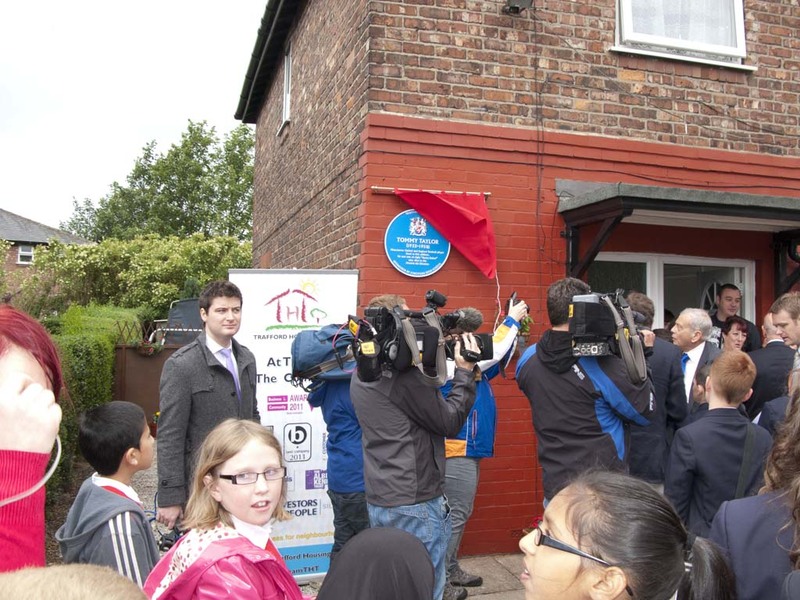 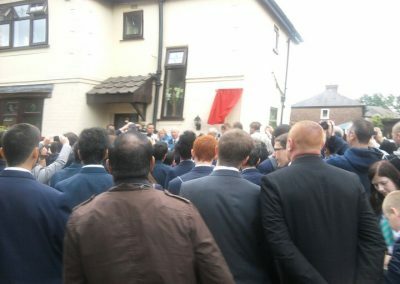 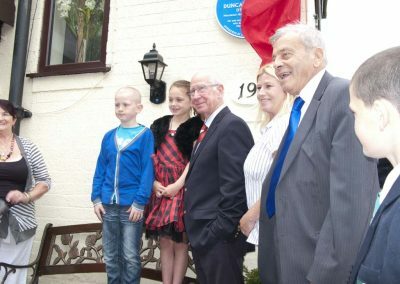 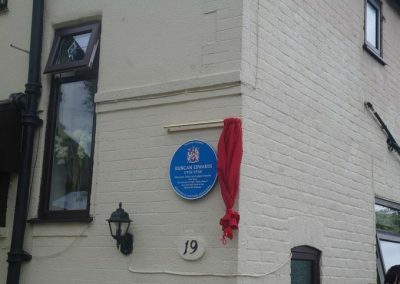 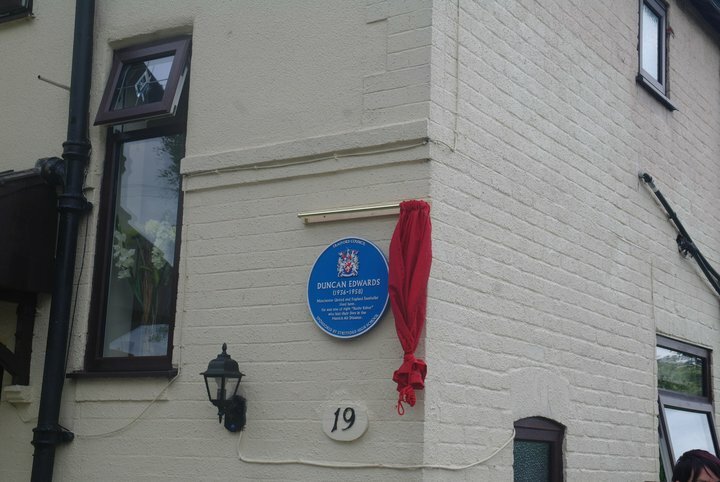 Historic blue plaques remembering where two members of Manchester United’s famous Busby Babes team once lived in Stretford will be unveiled by Bobby Charlton and Dickie Bird in July. 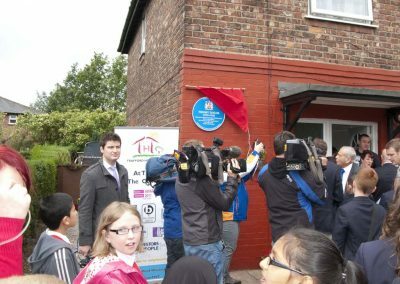 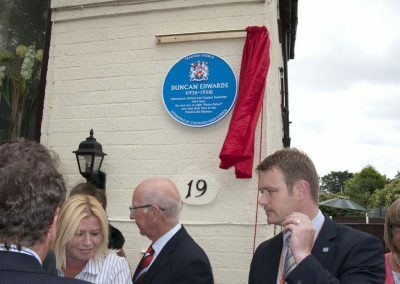 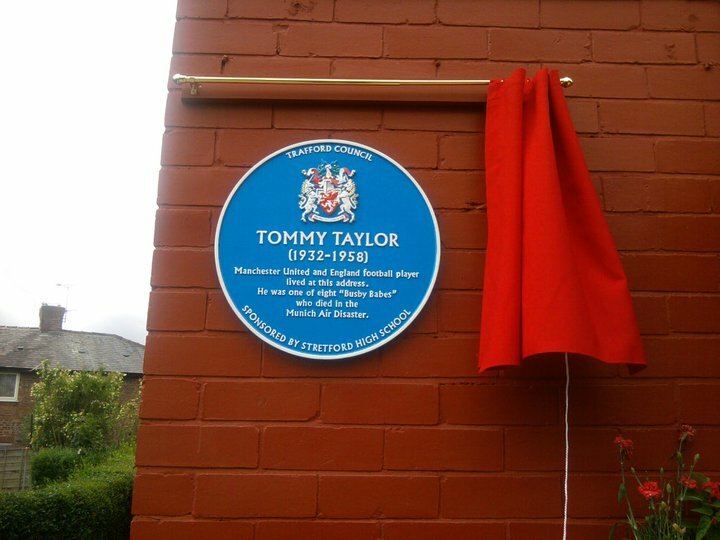 Trafford Council’s local studies team approved the plaques following an application by Stretford High teacher Chris Hirst, who as part of a Year 7 project learning about the famous team discovered how players Tommy Taylor and Duncan Edwards had lived just a short distance from the school – Taylor at 22 Great Stone Road and Edwards at 19 Gorse Avenue. 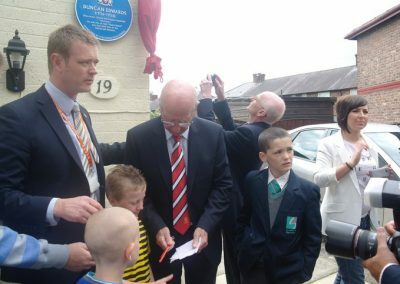 As part of the concluding part of the project former United boss Wilf McGuiness last week visited the school where he spoke to pupils about his time at the club during the Busby Babes era, and afterwards took questions from youngsters. 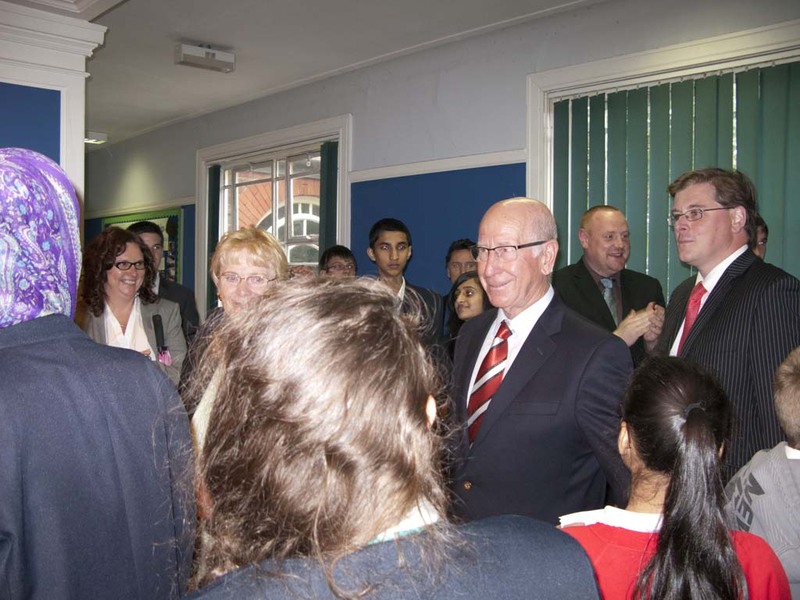 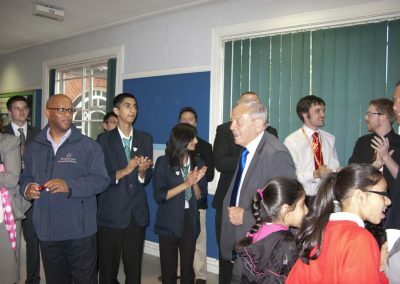 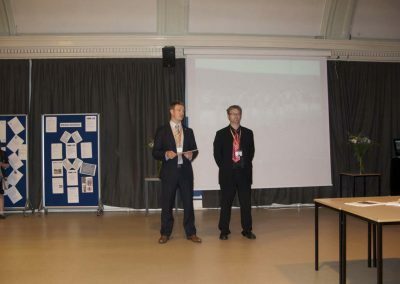 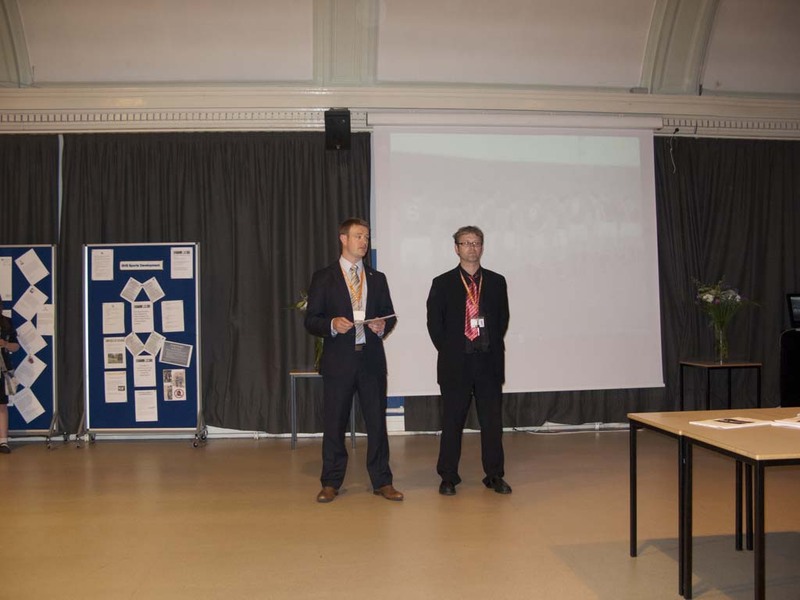 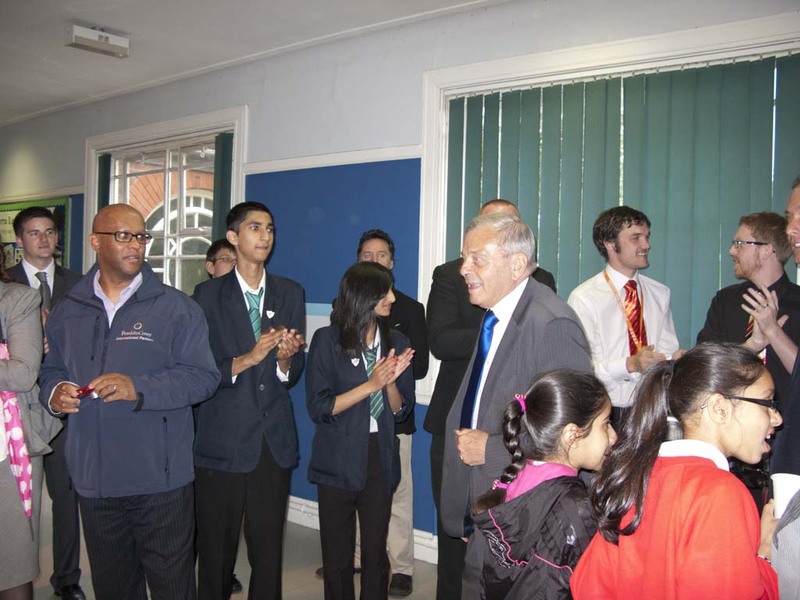 “He spoke warmly and passionately about his former colleagues, providing the pupils with a real understanding of what made that particular team such a great one,” added Chris. 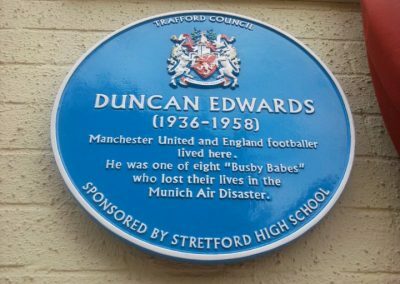 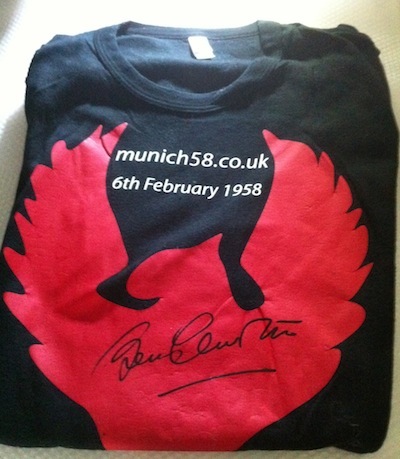 And commenting on the school project which spawned the idea, he added: “The pupils must have done a lot of research because they were coming out with all sorts of fascinating questions about the Busby Babes,” he added. 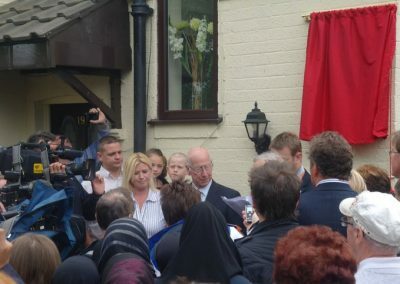 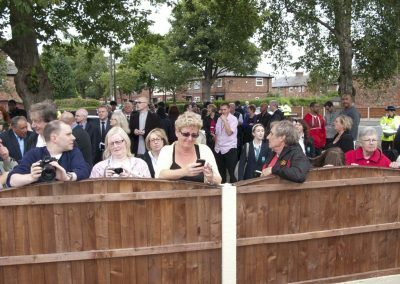 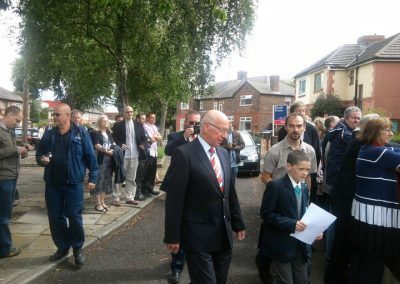 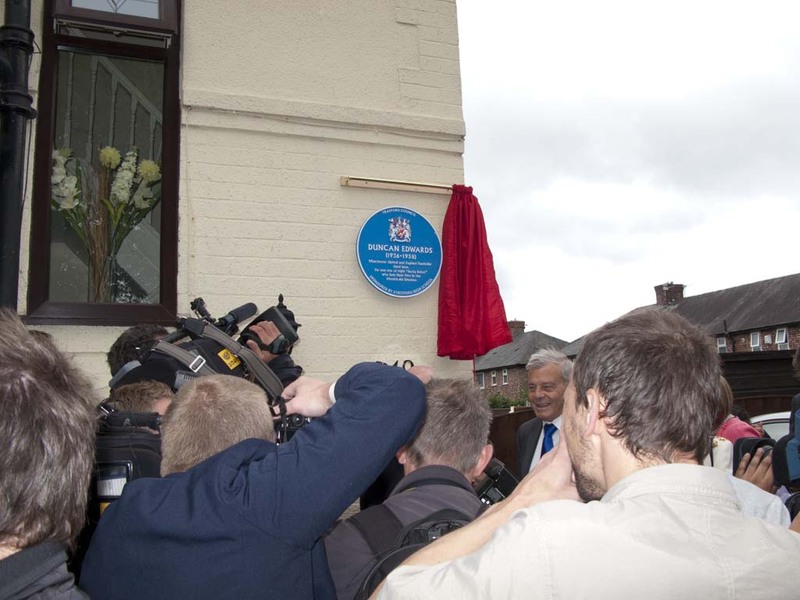 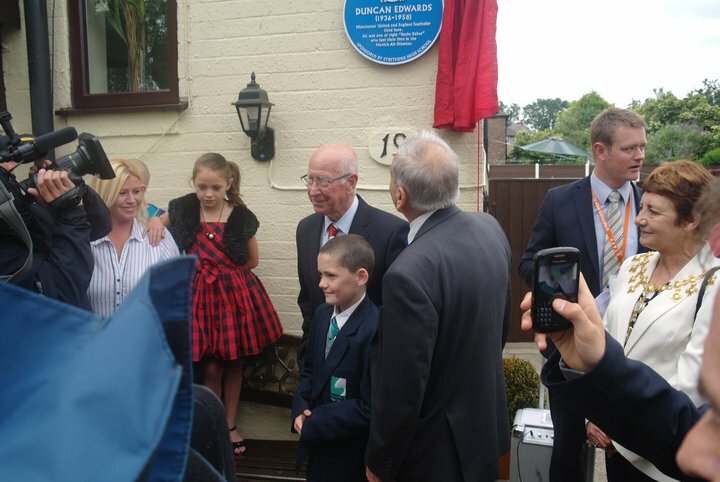 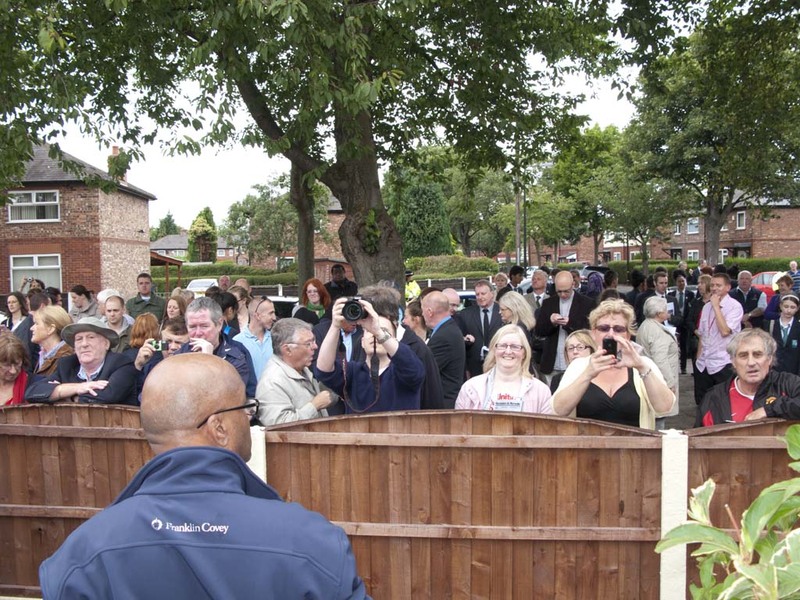 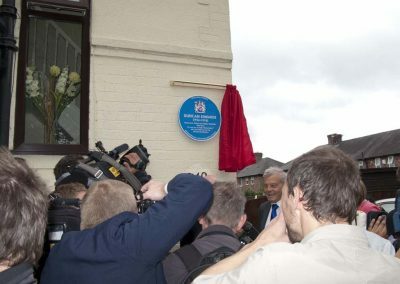 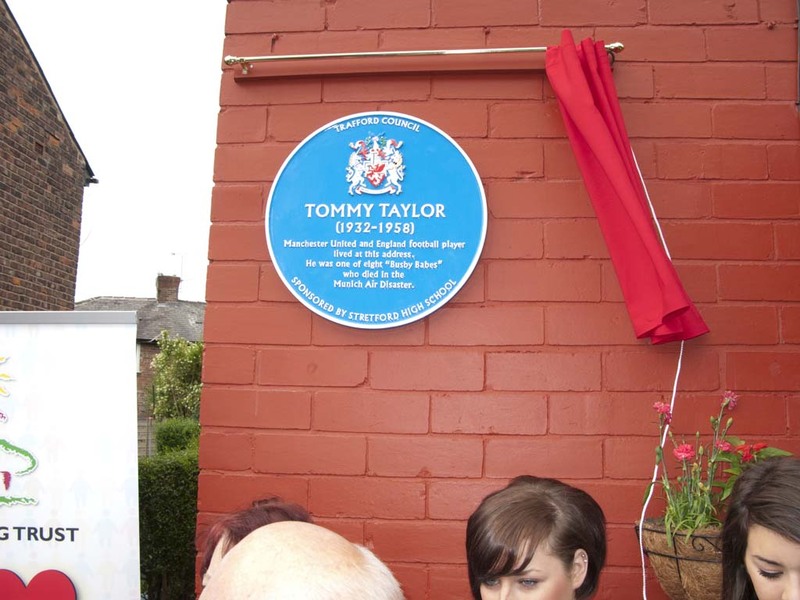 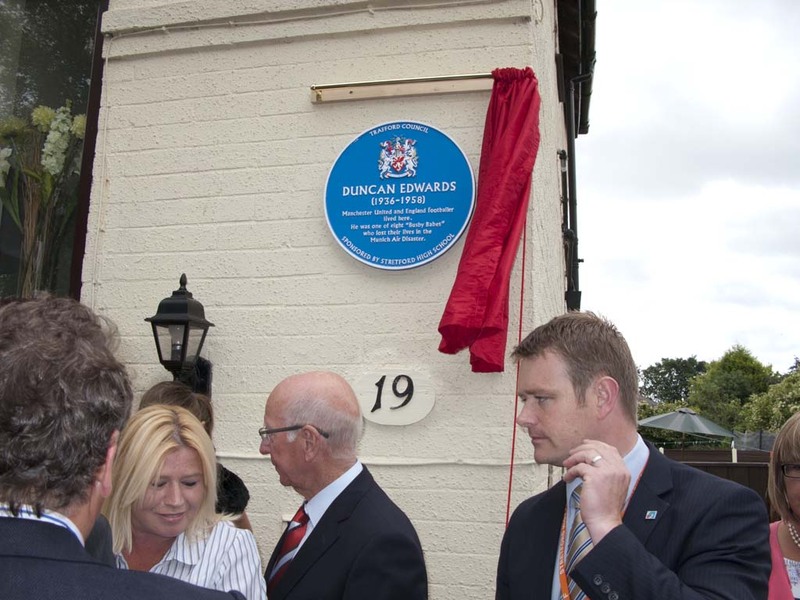 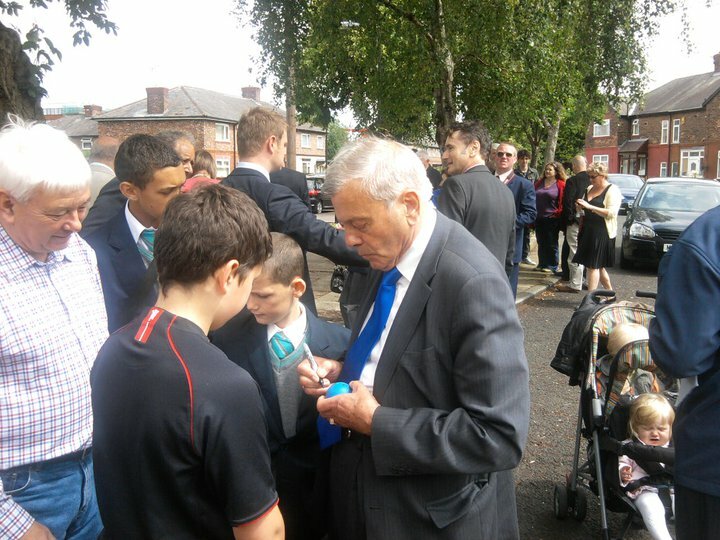 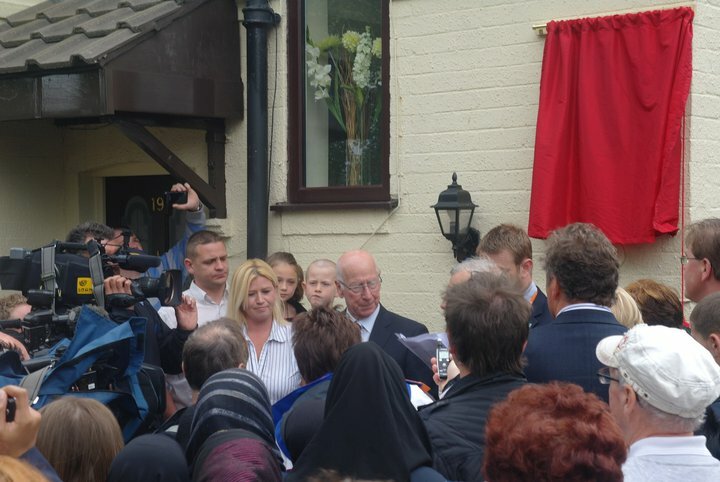 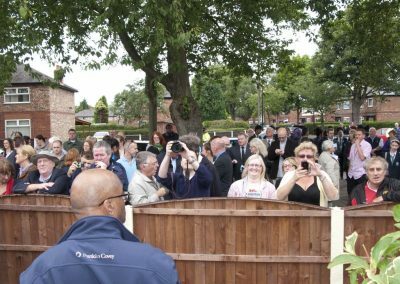 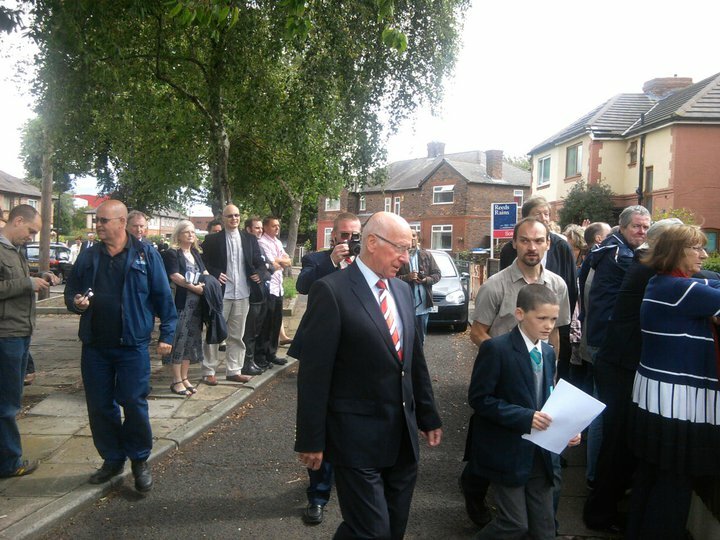 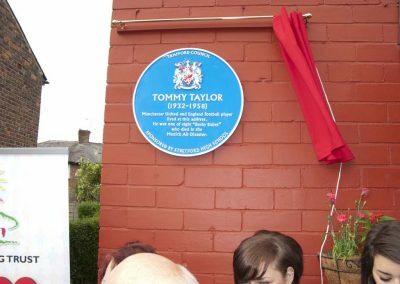 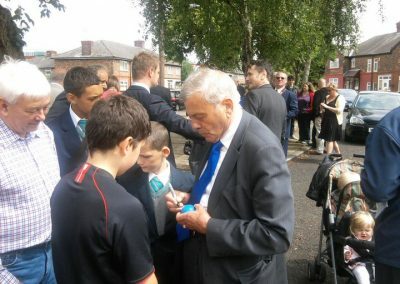 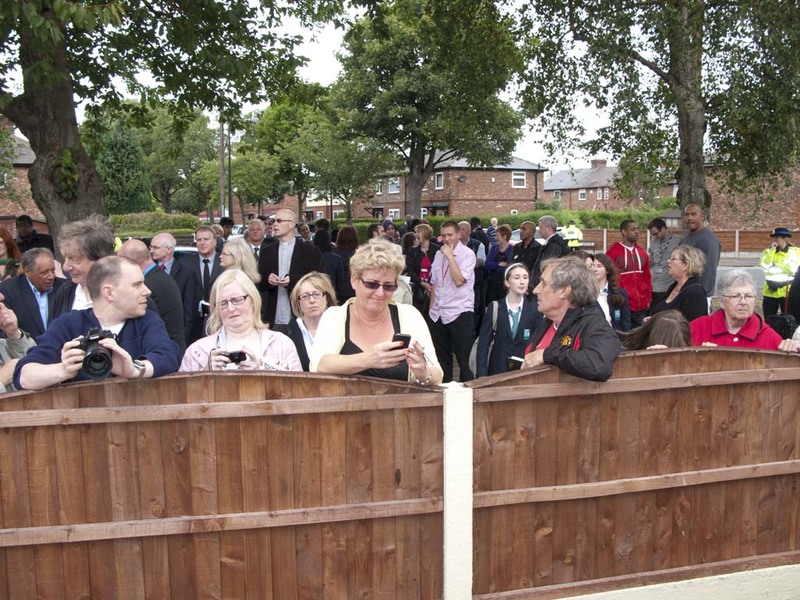 The grand unveiling of the plaques takes place on July 8 with Sir Bobby Charlton doing the honours at Gorse Avenue, while Tommy Taylor’s old school pal Dickie Bird unveils the plaque at Great Stone Road. 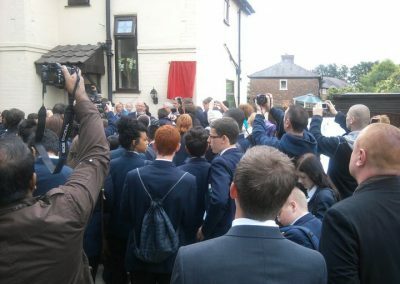 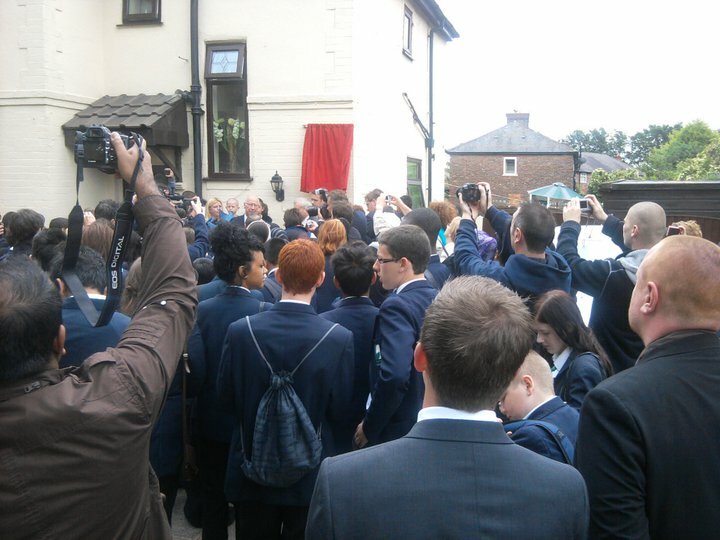 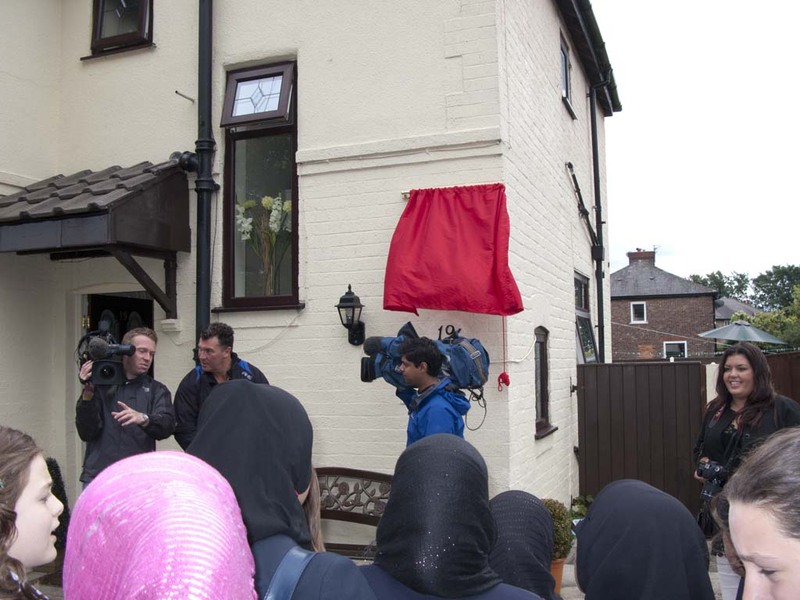 Prior to the unveiling, Chris and a couple of his students appeared on BBC Radio Manchester’s breakfast show. You can download the 3 minute interview/chat here (2.5MB zip file containing an MP3.